KayKiSpeaks.com: Jerry Sandusky's Lawyer says- "He was showing those boys how to shower" Um. Jerry Sandusky's Lawyer says- "He was showing those boys how to shower" Um. I think this guy has run out of options. 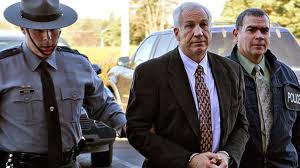 Sandusky has been accused of showering and sexually abusing young boys over the years as assistant coach at Penn State. The case has been growing and growing against him with more boys coming forward and colleagues coming forward saying they suspected something. As if the case against him isnt enough, his own lawyer is releasing statements that do more harm than help to him. Check out the video & statement when you read on. These people have got to be kidding me.